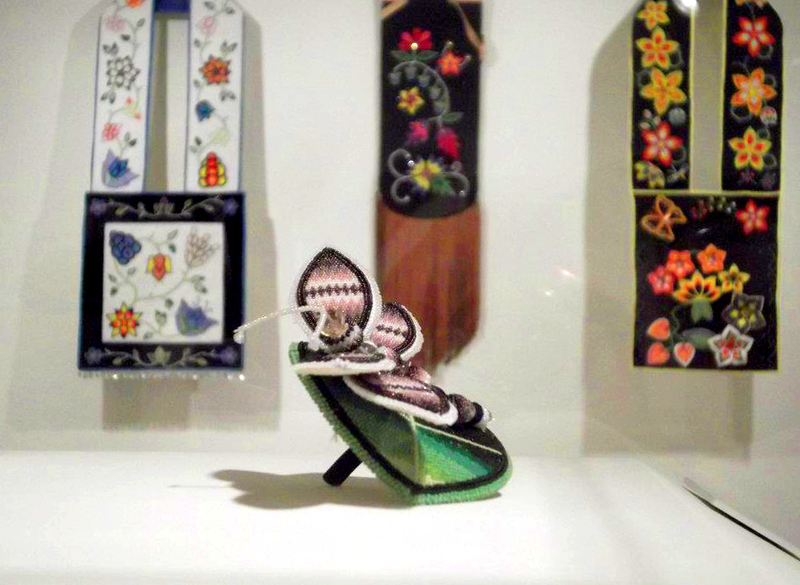 There is a new exhibit at the Tweed Museum of Art focusing on Native artists from the Minnesota region. 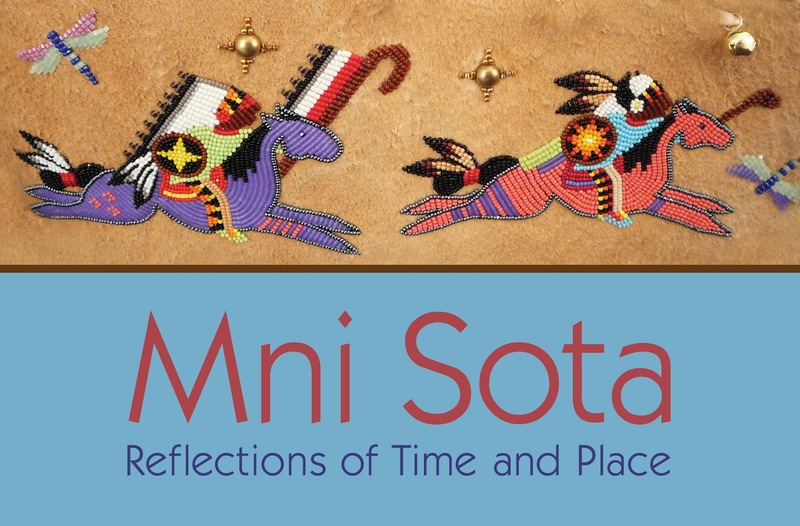 Titled, Mni Sota: Reflections of Time and Place, the exhibit showcases the skill and beauty of over a dozen artists whose creativity promotes cultural continuity. 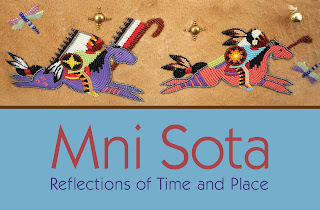 "The artists of Mni Sota provide stunning examples of ways in which Native Artists of the Minnesota region continue to embrace the contemporary while supporting tradition." The name “Minnesota” comes from the Dakota words “mni sota” interpreted as “clouds reflecting in water,” “smoky water,” or “cloudy water” - and this descriptive place name illustrates how our sense of place is defined by our surroundings. Tweed's literature about the show states, "Each generation’s work has built upon what has been established by the previous generations, incorporating new materials and media. Innovation is the soul of living art. Each generation, from historic times to the present, was creating contemporary art." First Nations art historian and curator Amber-Dawn Bear Robe was at the opening, and snapped some of the images below, which is how I came to learn of this exhibit. (Note the photos with the grey background are from the Mni Sota website). 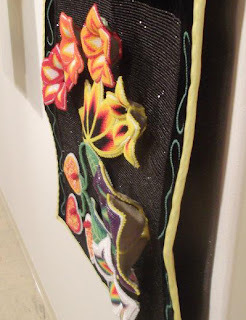 Some of the items in the show include this 3D Bandolier Bag made by Cecile Taylor (Spirit Lake Dakota and Turtle Mountain Chippewa), made in 2011 using black velvet, seed beads, leather, and yellow fabric. Bandolier bags were popular accessories worn by Native men. At first they served a utilitarian purpose - men's clothing didn't have pockets, so they needed a satchel to carry their tools. As the artform developed, the bags took on additional purposes tied to the symbolic and they became identity markers. After they were no longer 'needed' for utilitarian purposes of carrying stuff, women continued to create these for their men, sometimes even creating them with only one panel, so that they weren't even pouches anymore. While some contend that bandolier bags were adapted from European men's bags, others note that prehistoric examples of hide or fiber pouches are the predecessors. The floral beadwork is also interesting. Adapted from the floral beadwork taught to Woodlands Native American women by Anglo missionaries, these patterns were readily adopted in because plants played such an important role in everyday life and ceremonial practices. One Cherokee elder even noted that there were 'codes' and 'recipes' embedded in the floral work. The flowers, berries, and leaves were like a language and the bag itself was a text holding Indigenous knowledge. In the bandolier bag above, Cecile Taylor takes the artform to a new level by making the flowers three-dimensional as they spring out from the black beaded velvet background. 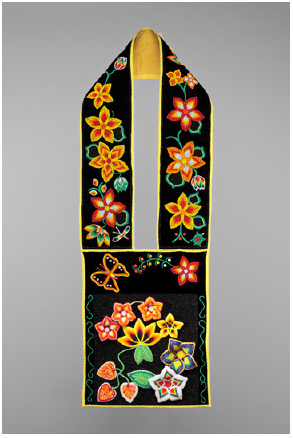 This fully beaded vest titled, Mother Earth Plains Spirit, was made by Sandra Panachyse (Canapawakpa Dakota, Mishkeegogamang Ojibway). 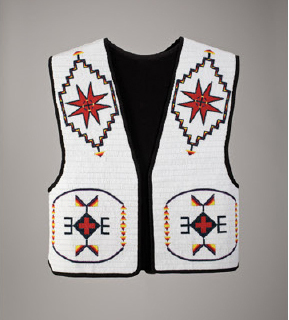 While this vest was made recently, it harkens back to the fully beaded clothing created during the end of the 1800s. At that time, several Sioux women responded to extreme societal disruption brought on by forced assimilation by turning to the arts. In fact, it was during this difficult time in Native American history that some of our most exquisite examples of beadwork emerge. In fact, author Marsha Bol stated, "Art can operate as a potent force in maintaining a cultural self-image due to its high visibility." One of the show’s curators, Dyani Reynolds-White Hawk, believes that the line that has historically existed between traditional and contemporary begins to dissolve when innovation is recognized as a tradition. 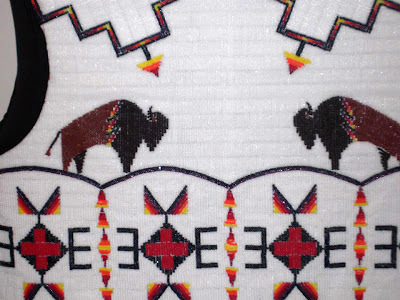 "That's what makes this exhibition so exciting,” Reynolds-White Hawk said, “by exploring the ideas of traditional art through a lens that recognizes innovation as a central theme, we are able to feature a wide range of artists, some without any previous exhibition experience, yet all truly worthy of such accolades. There are so many profoundly talented artists in the Native community, yet they often remain tucked away out of the public eye as ‘traditional’ arts are rarely recognized in the gallery system." The exhibit has traveled throughout Minnesota since November 2011. The Tweed is the last stop on the tour. The exhibit runs May 29th - August 26th, 2012.